First image of a new mod I'm working on. 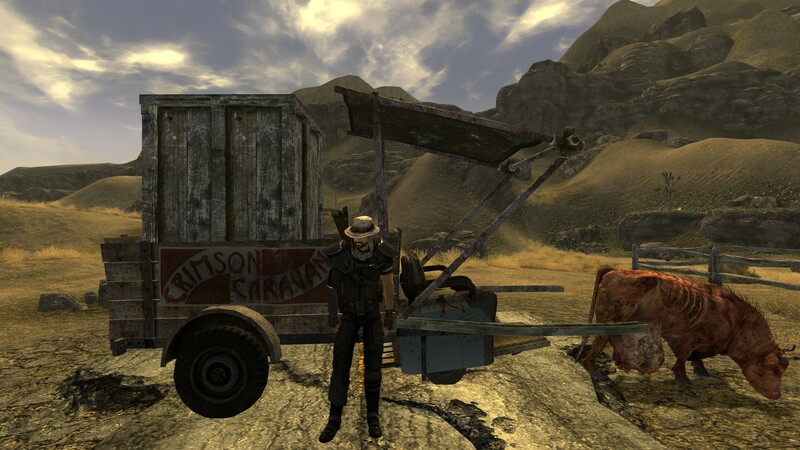 It aims to implement Brahmin carriages as an alternate fast travel method, similar to the horse carriages in Skyrim. god damnit, i was already making this, Good luck. Well, it's always good to have multiple alternatives, so good luck to you too! Thanks! Only just got started with implementing my plans though, so there's still a ways to go. Here's an idea to spice things up: a chance of travel being interrupted by raiders. You and the caravan guy have to fight raiders, if he also survives you can keep going, otherwise you are on your own two feets. Yup, there are plans for that as well, Luck-based random encounters. Maybe even faction relations as a factor, let's see how well the scripting goes along first. Can't wait to see the first release. Have a good time modding! Damn, It would be really an amazing idea.